I recently bought a new Nikon D90 DSLR after hearing all the excitement over the new breed of hybrid digital cameras. They have HD video as well as stills capabilities and can take advantage of the great DSLR lenses out there. The main advantage is the ability to get shallow depth of field which has normally been the domain of very expensive video cameras not within reach of the average videographer. The Nikon D90 is the first of this type of camera and was closely followed by the great Canon 5D Mark II. You can find many examples of the great videos produced by these relatively inexpensive cameras. So now we have the ability to create masterpieces and watch them on our computers and HD TVs, but what about internet distribution? How do we best share our creations? Obviously YouTube is the most popular video hosting site on the internet so we will probably want to start there. After doing some searching, I couldn’t come up with conclusive answers regarding the best format for uploading to YouTube to get great looking results. Most suggestions were just to upload the best quality file that you can. Although this would work, why spend hours uploading huge files if we can save time by uploading smaller files with similar results. My test started with uploading the file my camera produced without any conversion, straight to YouTube. The Nikon D90 produces an AVI file at 1280X720 resolution 24 frames/sec and about 22000 kbits/sec. To my surprise once uploaded to YouTube, I could play it in “normal quality” or “high quality” only. Where was the crisp HD version I was hoping for? Obviously this needed some further investigation as the original file from my camera definitely had enough detail to be HD worthy. So I opened the clip up in Quicktime Pro and saved it as a H.264 MP4 file in the original 1280X720 resolution and at 24 frames/sec. I started at 500kbits/sec which rendered a very poor quality result on my screen even before uploading, and went up to 20,000 kbits/sec which is about the same bandwidth as the original AVI file. Here is where I set the export options in Quicktime Pro. The idea was to load all these up to YouTube and discover what is needed to enable High Quality mode then what to enable HD. After that I wanted to see if there was a noticeable improvement all the way up to 20,000 kbits/sec. There is no point uploading these massive files if a file half the size would produce similar results, right? So here are the results and a few observations. Note the embedded videos below are in normal quality. You need to click through to YouTube (double click) to see the High Quality or HD option. Although you can embed the High Quality versions in a web page. you would not be shown the version you were watching that way. After converting the video to H.264 MP4 at 500 kbits/sec you can see the quality is very poor even played in normal mode, you do however have the option to play in High Quality mode which would be pointless. 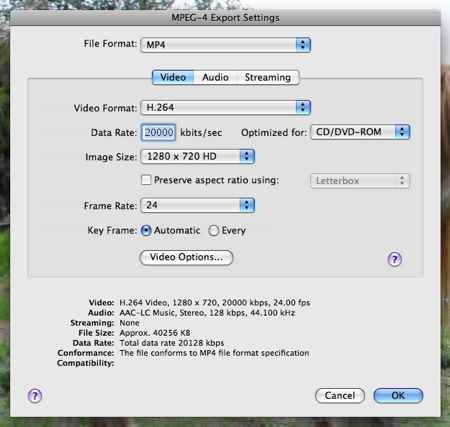 Some testing a while ago showed that video uploaded at a minimum of 480X360 resolution will get the High Quality option. At 800 kbits/sec the High Quality mode is still the only option but now we can see an improvement between normal and High Quality. At 1000 kbits/sec we now get HD! The quality is a lot nicer than the normal mode and the player is a lot bigger, now showing us the original 1280X720 resolution. it seems 1280X720 at 1000 kbits/sec is the absolute minimum to enable HD mode. I did try an upload at 900 kbits/sec but was only presented with the inferior High Quality mode in the smaller player. So in summary, for HD we want 1280X720 at 1000 kbits/sec minimum but do you see improvements right up to 20,000kbits/sec? I think I might see an improvement from 1Mbps to 2 Mbps, but after that I can't tell. Nice to know about the 1Mbps threshold for HD. Thanks for the tests. Excellent information! Thanks for posting all this! Great info, the comparisons are really helpful even for the digital camera ignorants like me. omg thank you so much! similar situation, and i was searching for quite a long time for someone who could discover how to 'unlock' the secret on how to actually get youtube to recognize the HD option when uploading a video.